Trump’s outreach to black voters isn’t about black voters. Donald Trump with Rev. 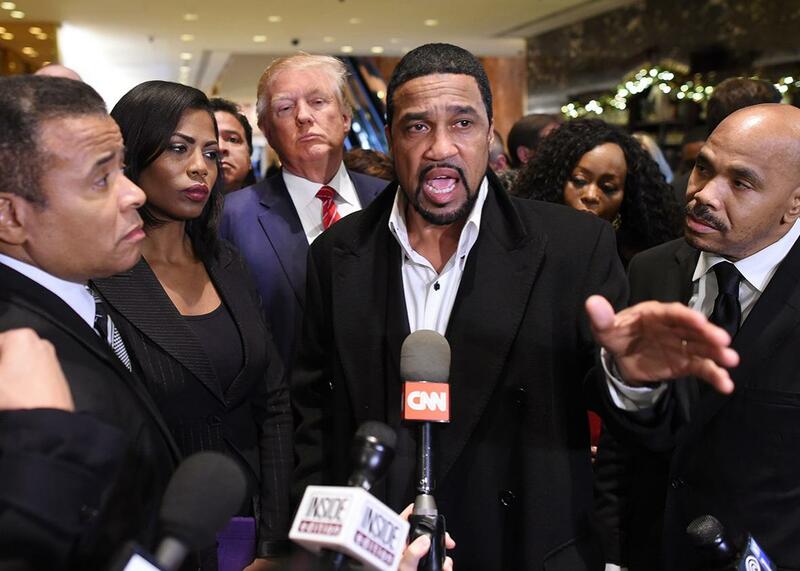 Darrell Scott (center), after meeting with black pastors at Trump Tower in New York, Nov. 30, 2015. The tail end of August finds Donald Trump making yet another pivot. He’s fired one campaign manager and hired another; he’s gestured toward contrition for his behavior and muddied his language on immigration, pledging a “fair” process for mass deportation. And he’s begun to court black voters using an unconventional message. It almost goes without saying that the facts here are wrong. Yes, blacks face major obstacles to upward mobility, among them structural poverty and unemployment driven by deep segregation and ongoing discrimination in job and housing markets. At the same time, most black adults are employed, most blacks aren’t poor, most black children attend decent schools, and—barring an unimaginable shift in the political landscape—most black voters (upward of 95 percent) will oppose Donald Trump in the general election. But as with his rhetorical moves on immigration, the content of Trump’s message is less important and less interesting than the audience he’s trying to reach. Hint: He’s not trying to win over black voters. If that were true, Trump would have made this pitch at a black church or any other space where black Americans are in wide attendance. And while Trump has an uncanny ability to convince himself of virtually anything, he must know that he stands little chance of winning even a sliver of the black vote, which has turned decisively against his candidacy. No, the point here—and the overall goal of this latest “pivot”—is to salvage Trump’s standing with college-educated whites, who have turned decisively against the alleged billionaire for his outright bigotry and general buffoonery. Trump does best among white men without a college degree, but the simple fact of this election is that there aren’t enough of them to win a national election. If 99 percent of white, non–college-educated men turned out to vote in November, according to demographer William Frey, Trump would still lose the popular vote by more than 1 million ballots given his deep deficits with every other demographic group. Trump needs to do something, and nonwhite voters are already too far gone for the real estate mogul to make up lost ground. (Trump is on pace to lose black voters by the largest margin in modern American history, surpassing even Barry Goldwater’s catastrophic performance in the 1964 presidential election.) Enter Kellyanne Conway, part of the latest round of political operatives to hitch their fate to Trump’s aspirations. Last week, Conway—who backed Texas Sen. Ted Cruz in the Republican primaries—supplanted Paul Manafort as manager for the Trump campaign. And in short order, she has worked to tame the worst of Trump’s behavior. The goal is straightforward: If Trump seems more normal and less erratic, then he could begin to win those white college-educated voters who are critical to victory in states like Colorado, Florida, North Carolina, and Pennsylvania. For Team Trump, it’s a simple equation. If those voters are turned off by his racist rhetoric, then he could address their fears by loudly reaching out to black voters. It’s an old strategy, meant to assure a critical set of Republican-leaning voters that they aren’t backing a bigot. Conway herself gave away the game in a Sunday interview with ABC’s George Stephanopoulos. “I live in a white community. I’m white. I was very moved by his comment,” said Conway, when asked about the all-white venue for Trump’s comments and the extent to which they sustain the idea that most black Americans live in poverty. Likewise, on Monday, Republican National Committee spokesperson Sean Spicer pointed to Trump’s belated adherence to anti-discrimination laws as evidence of black outreach, something that wouldn’t win a single black voter to Trump’s side, but might assuage some white ones. If Trump were an ounce more disciplined, this might work. Most Americans key into the election after Labor Day, and Trump stands a chance of convincing some that he’s a broad-minded businessman with a steady hand. But Trump’s reckless combativeness is part of his person—it’s not a persona. He’s incapable of sticking to a strategy, as evidenced by his gratuitous Monday-morning swipes at the hosts of MSNBC’s Morning Joe, Joe Scarborough and Mika Brzezinski. Worse for Conway (and perhaps those Republicans still hopeful he will change), Trump has a real affinity for the white nationalists and other provocateurs who surround his campaign. A Trump who hires the executive director of Breitbart (a virtual hub for online racists) and whose first ad for the general election is anti-immigrant demagoguery is not a Trump interested in being respectable. Yes, Trump is aiming some rhetoric at the center of American politics. Yes, he’s doing “outreach.” But don’t mistake this for some kind of “pivot.” There is no pivot. Trump has one move for this election, and he is going to keep playing it and playing it until he loses.